I am always happy to lecture to historic societies, book clubs, libraries, museums, community organizations, schools and colleges. It is my hope to inspire an interest in our classic writers among the general population of readers. To that end, I have quite literally brought some of my favorite writers back to life in living history performances, using in-character first-person interpretation. My fee for these 45 to 90 minute programs varies based on the situation (please ask!) and each performance is customizable based on the audience or location. Perhaps most well known is my sympathetic portrayal of the complicated writer/editor/critic/genius Edgar Allan Poe, which is based on my 15+ years of study of the author and his writings. In addition to reading from both his trademark and lesser-known works, Poe often explains the process of writing and the meaning behind his tales and poems. The programs often include interactive components. Poe's appearances are easily customized — from horror to humor and literary criticism to poetry. I usually try to mix his well-known works with a sampling of his lesser-known works. Many of my public Poe performances have had audiences at full capacity. 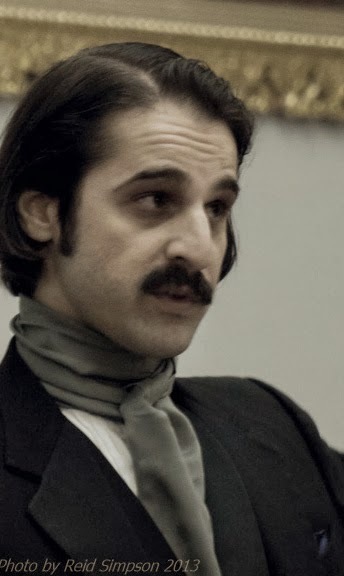 I have performed as Poe in 13 states (so far). 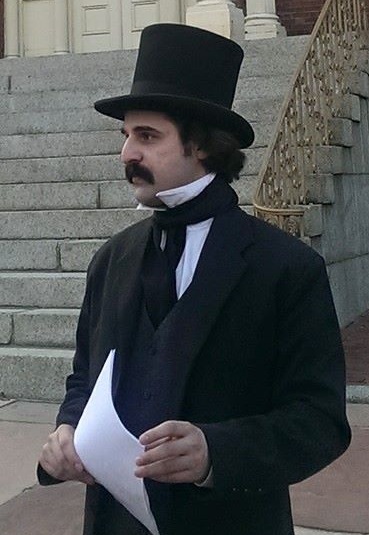 Nathaniel Hawthorne may also be seen making the rounds, especially in his native New England. A reclusive writer who does not enjoy public appearances, Hawthorne prefers reading his works instead of making presentations. His short tales are well-suited to various audiences, but I also present an abridged version of his famous novel The Scarlet Letter. My hope is to make Hawthorne's brilliant work easier to digest/understand for modern audiences. If it's December, ask about my "Holidays with Hawthorne" program. A trademark of all my performances is a question-and-answer session. Please email me for more information: robvelella (at) yahoo (dot) com. Or, take a look at my information sheet. I am a member of the group Solo Together. Visit their web site to learn about many other living history performers.